Today I’m sharing a super EASY method for making lined stockings. Now pair up one outside fabric with one lining/cuff fabric with the toes pointing the same direction like this. (See picture above.) Match the outside fabric and lining fabric from each set right sides together and sew a 1/4″ seam along the top of the two pieces. Open pieces up and press seam open. Repeat for back side. Now match front and back pieced units right sides together with outside fabrics matched up and lining fabrics matched up. Center seams should match up too. Pin to hold two sides together. Leaving a space in the lining fabric for turning right side out, sew all the way around the outside edge of the stocking pieces (-where gray line is drawn.) Click on picture to see closer view. I sewed a 1/4″ seam allowance around the outside [polka-dot fabric] and 3/8″ seam allowance around the green lining fabric, except the space left open for turning. This will help remove some of the bulk of the lining fabric. But if that’s too confusing, just sew 1/4″ for all. Before you turn everything right-side out, cut notches in the curves – especially the toe. This will help the toe look nicer when finished. Be careful not to clip through the seam. On the liner side, clip the fabric close to the seam. This will also help remove some bulk on the lining. Now pull everything right-side out. Carefully shape the outside part until the curves look good and press. Tuck the open ends into the stocking and topstitch the opening closed. Now carefully tuck the lining inside the stocking. Optional: Top stitch around the top edge for a more finished look. Fold cuff down and carefully shape stocking. Optional: add decorative trim if you want. I just used Elmer’s Craft glue to put on some ric rac. And you’re done! I suggest making a practice stocking just to see how it comes together and I guarantee each stocking you make after that will get faster and easier. You could easily make a bunch in one afternoon. Great tutorial. I will absolutely try out this one. I will have visitors from home coming this Christmas, for the first time since I moved abroad ten years ago. To make a pretty stocking for everyone to bring home feels like a great idea. Thanks for sharing. I am so happy I found your blog. You have helped me a lot getting into this wuilting and sewing world. oh, and I did make a table runner just like yours, teh stripy one, for Christmas that I just blogged about. But I did the top layer seperate, didn&#39;t quilt it together at once. I was to scared to try it… Silly me. Next time I will. Such an easy tutorial! I&#39;ve made stockings before with linings and had to go almost word by word when sewing and making the lining. This is so much clearer! Thanks! Thanks so much, I am going to try to squeeze in a few of these for Bath &amp; Body gifts!!! Thanks so much!! Thank you!! I&#39;m making some tonight!! woo hoo – right on time!!! I just started cutting out some mini-stockings for an ornament swap and was trying to figure out a quick easy way to put in the linings – thank you so much!! These stockings are so cute! Thank you for the tutorial. I have been looking at stocking tutorials for several days, and this is the only one that makes sense to me. Thank you so much! Thanks for this great tutorial! Last year I attempted a stocking and it took forever!!! Fantastic! I just made a lined stocking, but this looks so quick and easy. Can&#39;t wait to try it. What a great tutorial. Thank you SO much. I have a bunch of stockings I&#39;m supposed to make and have been afraid to start because of the problems I&#39;ve seen so many others have. I wanted to make really nice looking ones too with a lining so this is wonderful. <br />Have a wonderful holiday. 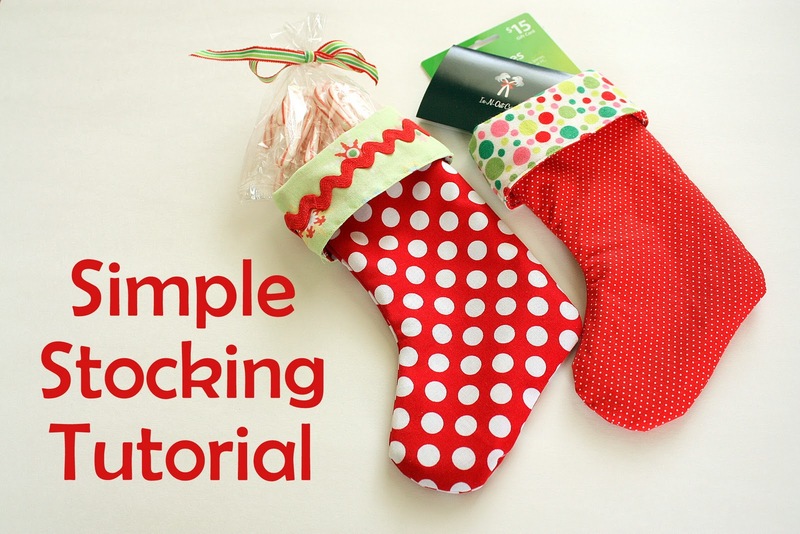 This is such an easy tutorial for lined Christmas stockings. And no seams showing! I understand it completely and san&#39;t wait to make one. Thank you for sharing. Great tutorial! I love your blog – so many great projects. cuter than cute. What a good simple tutorial. These are sooo cute, I love the idea of them as neighbor gifts! Thanks for sharing!! What a great tutorial. I can&#39;t wait to try this. I linked over from finding fabulous. I am your latest follower. Can&#39;t wait to see what else you have. I&#39;d love for you to come check out my blog and follow me back. http://www.diybydesign.blogspot.com. Thanks. Thanks for this easy and fun tutorial! I made 5 stockings for my family in one night using this. It&#39;s so fast and they turned out very cute! Easy and pretty. I love it and plan to put a few together ASAP! Thanks. I am so happy to have found this! I just used it to make one, thank you so much!! What a neat idea, great tutorial, thanks! Love this tutorial! Just made a practice stocking and it turned out perfect!! Plan on making a bunch more! Thank you! Just made 10 stockings for the family this year, everyone is getting a handmade ornament and a gift card! Love the tutorial. I added a loop in the lining and it turned out so cute! Thanks! WONDERFUL! very easy to understand and makes the idea of making my own stockings less daunting 🙂 Will be doing this for sure! Great questions about the loop. The only way I&#39;ve figured out to attatch a loop because of the fold down cuff, is so sew it right at the top of the lining after the stocking itself is completed. You should be able to hid the stitches on the outside underneath the fold down cuff. I&#39;ve attached the loop with a bit of twill tape and a button –love the tutorial also, thank you! Thank-you SO much for this tutorial. I&#39;ve wanted to make stockings for my family but it seemed so arduous and confusing. Today I made 6 stockings in no time! You are the best! I just came across this blog for this the other day. I am so happy to finally find an easier way of doing stockings. I do a lot of craft fairs my mine one is around this time of the year especially in November. I find these so beautiful. I am just wondering if I could add some ribbon for it to hang or make one of out of fabric. I am having a hard time following your instruction on how to add a loop. Any chance you could post a picture? Hi I too want to add some batting in to stiffen it up. Any chance you can share a picture? Thanks! Just had to tell you that I did a Pinterest search for Christmas stocking ideas today and smiled when your tutorial popped up — I know that girl! 🙂 Isn&#39;t it cool how these blog posts live out there on the Internet for years, continuing to inspire people? Thanks for yet another great tutorial. I love this tutorial! I have been making stockings,6 so far, and I was having a problem with the lining. This has really made it simple Thanks!!! This tutorial seriously saved my bacon! I was staring at my sewing machine trying to figure out how to line, and add a back to a cross stitched stocking front that a friend brought me, and I was at a total loss! Thanks so much! This is great ! There’s only one problem I have. I need to put piping at the top. Can you help me with that? The only way to do it with this construction method would be to insert the piping when you sew the seam between the two front and back pieces. But it will start and stop with the two side seams. If you want continual piping around the top, you’ll need a different construction method. I just discovered your fabulous tutorial on Pinterest! I have a Christmas Stocking that I am quilting first and was not quite sure how to get it together properly. With your excellent tutorial it will be easy peasy! Thank you for sharing and have a wonderful creative day! Your tutorial was perfect. Just finished my first one and I can see making many, many more before Christmas with personalized fabric. Thanks for clear and easy to follow instructions. Thank you!! This is perfect! Making stockings for the pups this year! I found you on pinterest and wanted to let you know even after 5 years of you doing this …it’s still helping people like me….thank you so much…it work prefect…. 10+ Patterns: Quilting for Christmas - Sew What, Alicia? I wanted to let you know that this DIY stocking is featured on my blog to inspire our Bee Creative Stocking Swap participants. That’s awesome! I’m so glad to hear it was helpful. Awesome! I’m so glad to hear! Thank you so much, the shocking are wonderful! Can’t wait to try this out!! Thanks so much for this. You’re right, the more you make, the faster and easier it gets. I’m presently making as many of these as I can for a fundraiser for paying veterinary bills for those that cant afford emergency care. I attempted a few others that werent as good before deciding on this one. So, thank you! And Merry Christmas! Hi Amy! I LOVE this tutorial! Thank you for sharing it with us all! My stocking came out perfect and is ADORABLE! I added a bit of fabric in a loop to hang it up, but when I do the liner lifts out of the shell a bit. Any suggestions for keeping the liner all the way down and in its rightful position? Thinking I’ll have to hand stitch the seams together so its unnoticeable. Thanks! Hmm, I think you would have to attach it through both layers to keep in the liner from lifting out. Your plan sounds like a good one – let me know how it goes! This was so easy and the end result is sweet! Thank you! Thank you!! Awesome pattern for Christmas stockings!! Very helpful. I’m making a bunch for a craft fair in Nov! Thank you for these great instructions! Love how the stocking turned out! This is so easy to follow. I don’t particularly like watching tutorials on Youtube because the host talks so lengthily and it gets so boring that instead of finishing it you stop watching and make it on your own ( nevermind if it doesn’t resemble like the one you really like. Thank you for this tutorial. Oh good! I’m so glad – you’re welcome! Thank you so much for publishing this. Wonderful instructions. I have linked your tutorial to my blog post “10 ways to wrap with fabric”. Hope you have a wonderful Christmas. Genius, so simple. Thanks for posting this!